The left-hand part of this photo has been widely published by the Atlantist Press. The victim, a Syrian Kurd child, Aylan Kurdi, is supposed to have been washed up by the sea. However, his corpse is perpendicular to the waves instead of being parallel. On the right-hand part, the presence of an official Turkish photographer reinforces the suggestion of a staged event. In the background we can see people bathing. A wave of brutal emotion suddenly submerged the populations of the NATO countries. People suddenly realized the drama of the refugees in the Mediterranean - a tragedy that has been going on for years to their complete indifference. This change of attitude is due to the publication of a photograph showing a drowned child washed up on a Turkish beach. It doesn’t matter that this photo is staged - the sea washes up bodies parallel to the waves, never perpendicular. It doesn’t matter that in less than two days, it was instantly reproduced on the front pages of almost all the newspapers in the NATO zone You have already been advised that the Western Press is free and pluralist. Continuing in the same vein, television channels multiplied reports on the exodus of thousands of Syrians who were crossing the Balkans on foot. Particular attention was given to the crossing of Hungary, which first of all built a completely pointless barbed-wire fence, then made a number of contradictory decisions which allowed the filming of crowds walking along the railway lines and mobbing their way onto trains. « Reacting » to the emotion that they had provoked in their citizens, the « surprised and upset » European leaders struggled to find a way to bring help to these refugees. Antonio Guterres, ex-President of the Socialist International, and present UN High Commissioner for Refugees, invited himself to the debate, advocating « the obligatory participation of all the member states of the European Union. According to preliminary estimations, European countries will probably have to expand their relocation opportunities to 200,000 places », he declared. What is the real problem, who is managing it, and what is their goal? Since the « Arab Spring », in 2011, the number of people attempting to cross the Mediterranean and enter the European Union has augmented considerably. It has more than doubled, and rose to 626,000 in 2014. However, contrary to a common misconception, this is not a new and unmanageable wave. In 1992, when the Union numbered only 15 of its current 28 states, it received even more than that - 672,000 refugees for 380 million inhabitants. So there remains a considerable margin before the refugees begin to destabilize the European economy and its 508 million present inhabitants. More than two thirds of the migrants are men. According to their declarations, more than half of them are between 18 and 34 years old. So, generally speaking, this is not a family issue. Proportion of male migrants who entered the Union in 2014. Contrary to the information presently being published by the media, less than a third of these are refugees from war zones: 20 % are Syrians, 7 % are Afghans, and 3 % are Iraqis. The other two thirds do not come from countries at war – they are for the most part economic migrants. In other words, the migration phenomenon is only marginally linked to the « Arab Spring » and war. These are poor people who leave their countries to try their luck in the rich countries, by virtue of the post-colonial order and globalization. This phenomenon, after having slowed from 1992 to 2006, has started again, and is progressively growing. It only currently represents 0,12 % per year of the European population, and so – if correctly handled – should present no short-term danger for the European Union. The President of the German Industrial Federation, Ulrich Grillo, hopes for 800,000 extra foreign workers in Germany. Since European agreements forbid this, and since public opinion is hostile to the idea, he is playing his part in the staged « refugee crisis » in order to force the evolution of the law. Do the migrants pose a problem? This flow of refugees is a worry for the European populations, but is warmly encouraged by German business leaders. In December 2014, the German « boss’s boss », Ulrich Grillo, hypocritically masking his interests behind a trickle of fine sentiment, declared to the DPA : « This counry has been open to immigration for a long time, and it must remain so ». « As a prosperous country, and also out of Christian love for our neighbours, our country should be able to welcome more refugees ». And again : «I want to be clear – I am in no way close to the neo-Nazis and racists who are meeting in Dresden and elsewhere ». More seriously : « Because of our demographic evolution, we are consolidating our growth and prosperity through immigration » . This speech uses the same arguments as those used by the French business leaders in the 1970’s. Even more so today, the European populations are relatively well-educated and qualified, while the great majority of migrants are not, and can easily assume certain types of work. Progressively, the arrival of a non-qualified work-force who would accept conditions inferior to those of Europeans was causing tension on the job market. French bosses then began to push for family regrouping. The law of 1976, its interpretation by the Conseil d’État in 1977, and the jurisprudence by the European Court for Human Rights, deeply destabilised society. Since the adoption of the same dispositions, the same phenomenon can now be observed in Germany, with the inclusion, in 2007, of family regrouping in the immigration laws. Contrary to a widely-held belief, the economic migrants do not cause an identity problem in Europe, but are missed in their home country. On the other hand, they are causing social problems in Germany, where the working class is already the victim of ferocious exploitation, because of the policies introduced notably by Ulrich Grillo. Everywhere else, it is not the economic migrants who are causing the problem, but the family regrouping. 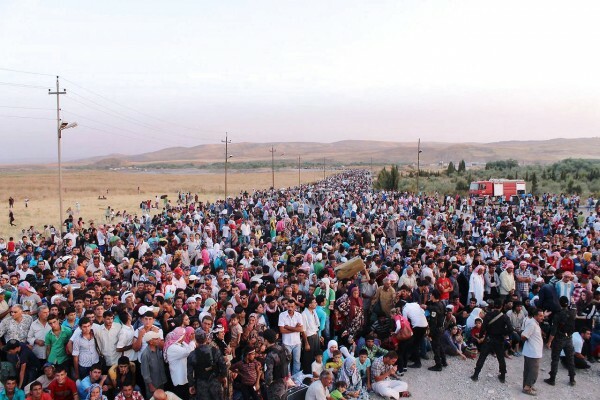 Who is fabricating the current image of the «refugee crisis»? Since the beginning of the year, the passage from Turkey to Hungary, which used to cost 10,000 dollars, has dropped to 2,000 dollars per person. It’s true that certain human smugglers are slavers, but many of them are simply trying to make themselves useful to people in distress. In any case, who pays the difference ? Furthermore, at the start of the war against Syria, Qatar printed and distributed false Syrian passports to jihadists from al-Qaïda so that they could convince Atlantist journalists that they were « rebels », and not foreign mercenaries. False Syrian passports are today distributed by certain smugglers to non-Syrian migrants. The migrants who accept them rightly believe that these false papers will facilitate their welcome in the Union. Indeed, since the member states of the European Union have closed their embassies in Syria - except for the Czech Republic and Romania – they have no way of checking the validity of these passports. Six months ago, I was astonished by the blindness of the EU leaders, who failed to understand that the intention of the United States was to weaken their countries, including by means of the « refugee crisis » . Last month, the magazine Info Direkt confirmed that, according to the Austrian Intelligence services, the passage of Syrian refugees to Europe was organised by the United States . This charge still has to be verified, but already constitutes a solid hypothesis. Moreover, all these events and manipulations would be without gravity if the member states of the EU would put an end to family reunification. In that case, the only real problem would not be the arrival of the migrants, but the fate of those who die on their journey across the Mediterranean. And that is the single reality that no European leader wants to consider. So far, NATO, or in other words the international armed branch of the United States, has not reacted. But according to its most recent missions, the Atlantic Alliance is reserving for itself the possibility of military intervention if the migrations should become important. Since we know that only NATO is capable of publishing false information on the front page of all the newspapers of its member states, it is very probable that it has organised the present campaign. Besides which, the fact that all migrants are represented as refugees fleeing the war zones, and the insistance about the supposed Syrian origin of these migrants, allows us to suppose that NATO is preparing a public action linked to the war which it is secretly waging against Syria. «Allemagne : le patronat veut plus de réfugiés», AFP, 23 décembre 2014. “The European Union is blind to the military strategy of the United States”, by Thierry Meyssan, Translation Pete Kimberley, Voltaire Network , 14 May 2015. “Insider : Die USA bezahlen die Schlepper nach Europa !”, Info Direkt , 5. August 2015. « Les USA accusés de financer l’envoi de réfugiés en Europe», Réseau Voltaire , 13 août 2015.